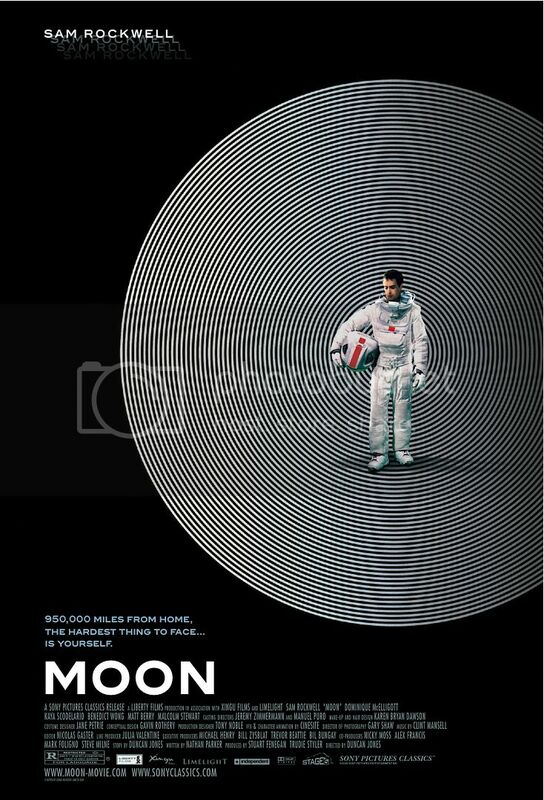 Moon, a pensive and spare sci-fi film, may not have much cross genre appeal - it's too slow and opaque for that - but, for those who enjoyed Solaris (er, the book), 2001: A Space Odyssey (uh, the movie) and other thoughtful sci-fi classics, this will be a treat indeed. Unfortunately, much of the plot is best kept secret, as there are great narrative moments which hinge entirely on the revelations encountered by Moon's solitary protagonist, Sam Bell (Sam Rockwell). Sam, bedraggled, lonely and infinitely bored, is just nearing the last two weeks of his three-year contract on the moon, where he manages an energy harvesting base station. It is the near future, and Lunar Industries has solved Earth's energy crisis with a new source of clean fuel: moon rock... or something. The details aren't important, as it's not the technology of Moon which is its point, it's its heroic quest for Sam (if you can call it that). After experiencing some hallucinations and mysterious blips in his days (pretty par for the course when it comes to lonely astronauts on film), Sam takes one of the cruisers out to check on a broken moon rock harvester... or whatever. On his way, he gets distracted by something and hits the harvester. He wakes up later, back in the lunar station's infirmary, and there begins his tumble down the rabbit hole. How did they change the focal depth from right to left? HOW? A film as ponderous and minimalist as this made us worried that it would go for a weird, ambiguous ending - thankfully, Moon does actually, really, truly end, and it's a pretty satisfying conclusion to a slow, methodical build-up. For a movie about the blurring of reality and identity, with a protagonist leaving smudges and stains on his fancy lunar station, everything finishes quite tidily. Sam Rockwell carries the film with ease - ranging from the vitality of Sam at his highs to the wretched wasting away of Sam at his lows. Kevin Spacey provides the voice of Gerty, Sam's station computer, and - while we were distracted by the fact that (1) Gerty was "I can't let you leave, Sam! "-ing under HAL's lengthy shadow, and (2) Kevin Spacey lives in London now, right? is this why he's in this British film? just wondering - he is fine. There is no other character of importance. Um, sort of. It's nice to see genuine sci-fi now and again, since the genre seems to have been kidnapped by comic book fanbeings and big explosions ever since George Lucas decided to revive Star Wars (and then murder it repeatedly). Everything's gone a bit pulpy and popcorn-brained, and we can't think of a single sci-fi film from the last 10 years that was confident enough to be (1) slow, (2) filmed on a low budget, and (3) not using any guns or lasers or aliens or killer robots. The only film that sort of approached serious sci-fi high art recently was Sunshine, but then it too was derailed into a sort of half-baked Event Horizon sequel (and, much as we love Sam Neill, the world really only needs one Event Horizon). Moon then is refreshing in its adult simplicity. I thought Sam Rockwell was ROBBED by the Academy Awards. One-man absolute tour de force, anyone? Alas, not that it surprised me.